Sausage rolls are a massive favourite with my kids … and husband! They are easy to make and they are perfect for hiding lots of veggies, so it is nice to know that they are a slightly healthier option for my family I have changed and modified my mix over time and this is the mix that I have found gives the best flavour and binds the best without egg. I use Chevup sausages in my mix. They are a skinless, gluten free, Aussie beef sausage with about half the saturated fat of normal sausages – I feel much happier about using them than the sausage mince that is commercially available. You can find more details about them here. The sausages I use also have a lovely flavour, so if you are using regular beef mince, there is a note below the main ingredients for a couple of extra things for you to add. Gluten, egg, dairy, nut and soy free pastry is the next issue. There are many GF pastries out there but they are often really disappointing. Obviously use the one that suits your diet and that you enjoy. And it does a pretty good job. But …. 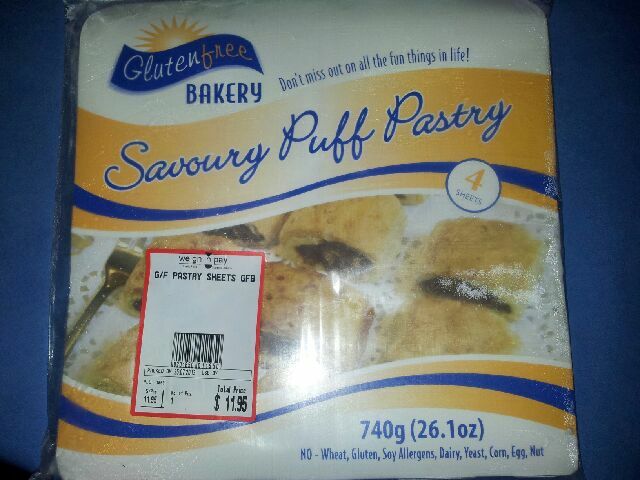 if you live in WA you really, REALLY have to check out Busy Bees Gluten Free pastry (I buy from Weigh n Pay in Woodvale)! It is amazing! It comes in a long roll and it handles just like wheat based pastry. It is soft and easy to work with and even non GF people have been happy to eat it! Finely grate the carrot, zucchini and pumpkin. (Speed 6 for 8 seconds, scrape down and repeat). Then add in the mushrooms, spinach and chick peas and process until the mix is fine (Speed 6, 10 seconds, scrape and repeat). Add the sausages and mince, to the processor and process until it is quite smooth (Speed 6, 15 seconds at a time, scrape down in between). Add the breadcrumbs. Start with 1/4 a cup and gradually add more if the mix is too wet. (Speed 6 for 10 seconds at a time) I used about 2/3 cup last time. The mixture should stick together quite well. Cut the pastry sheets in half and divide the mixture up between the sheets. I find it is best to place it in a thin line down the middle of the pasty. Roll the pastry over the top of the mix to form long cylinders. Lay on a greased baking tray with the join side facing down (helps the join to hold together as it puffs). Cook in a preheated 210C oven until meat is cooked and pastry is puffed and golden brown. (use a short burst under the grill to get them extra golden and flaky). Takes about 35-40 mins in my oven. Makes quite a lot of sausages rolls (about 45 party sized ones) … so I did have to convince my kids that they couldn’t just keep eating them because they were there. They freeze well – just reheat in an oven, not a microwave otherwise you get soggy pastry. Used this as a base to make sausage rolls tonight. Used a couple changes bit overall worked out very well. Thanks.